"ONE of the most frightful railway disasters of recent years occurred early on Saturday morning last, on the Vermont Central Railroad, some four miles from White River Junction. The wrecked train, the Montreal express, consisted of an engine, one baggage and express car, one mail car, two ordinary passenger coaches, the sleeping car St. Albans, from Springfield, Mass., and the Pullman sleeper Pilgrim, from Boston. The car St. Albans carried about twenty-six passengers. There were forty in the Pilgrim, from Boston. Besides these were about fifty way passengers. Four miles north of White River Junction the Vermont Central road crosses the White River, on a bridge 650 feet long. The water is fifty feet below the rails and is eight feet deep. When the disaster occurred, at 3 o'clock on Saturday morning, there were two feet of ice on it and the thermometer marked 20 degrees below zero. The abutments of the bridge are of gray granite, as are the three piers at equal distances between them. It was at this point that the train met its fate—a broken rail 200 feet from the bridge being the cause. Whether the train broke the frosty rail, throwing the cars from the track, whether the rail was broken before the train arrived, or whether some wheel gave way and snapped the rail is not known, and may never be known. In an instant there was a jar, a bumping of trucks over the railroad ties. The coupling between the forward sleeper and the four following cars broke, the engine, baggage and smoking cars passed on to the bridge and over in safety, but the other four cars bumped along over the ties to the end of the bridge, knocked out the heavy timbers which rested on the abutment, and then toppled over—bridge, cars and human freight, fully eighty souls all told, falling with a tremendous crash down the jagged precipice seventy feet, striking upon the frozen surface of the river. Then followed a scene which beggars all power of human description. The splintered wreck took fire, and the dark gorge, from which the moon was hidden, was soon lighted up by the glare of burning coaches and bridge timbers. The detached portion of the train was stopped and run back to the scene as soon as possible. 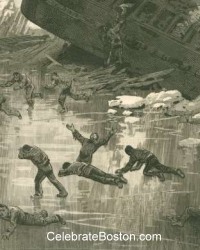 Those on board sprang into the deep snow and made their way as best they could down the steep banks to assist any in the wreck who were alive. Here and there a man or woman had succeeded in getting extricated from the debris by leaving part of his or her clothing behind, and, in spite of the intense cold and their half-clothed condition, were bravely rendering all the assistance in their power to rescue their less fortunate companions. 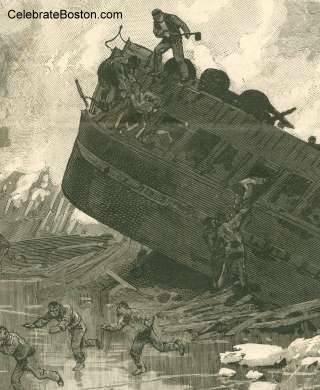 Many were pinned beneath huge timbers, beyond all human aid. The groans of the half-conscious dying, the screams of the burning, mingled with the hoarse shouts of the trainmen and a few farmers who had arrived on the scene, made a pandemonium. Very little could be done to aid the injured. and absolutely nothing toward quenching the flames. The ice on the river was two feet thick, and no water could be procured. At least forty persons were killed outright or burned to death. Three only of the killed were recovered from the wreck. About forty persons escaped, most of them being badly maimed or burned, some of whom will die. It is believed that between fifty and sixty persons in all perished. The heat being strong enough to melt the ice in some places, many of the dead probably fell in the current and so were carried away. Among the unfortunate passengers were a number who were on their way to the Montreal carnival. The search for the bodies of victims was carried on through Saturday and Sunday, but only the remains of a very few were recognizable." Just over one month later in March 1887, the worst train wreck in Massachusetts history occurred at Bussey Bridge in Roslindale.